The Order of Marriage is a service of worship. Therefore, the celebration of a marriage in the church should be Christ centered. No matter what other happy events precede and follow the wedding service, the Order for Marriage will always be viewed as a service of worship. 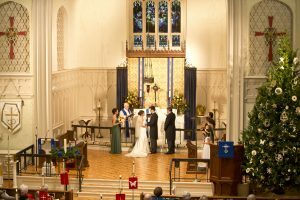 This brochure sets forth policies established by the Lutheran Church and also describes customs for the Order of Marriage at the Lutheran Church of the Resurrection. Please familiarize yourself with them and ask the pastor or the wedding director about anything you do not understand. The first step in wedding planning is to contact the pastor to confirm the date and time for the wedding and to reserve the church and the pastor’s services. This should be done as early as possible, no later than three or four months in advance. There will be no weddings performed during Holy Week. It is the policy of this church that the pastor should preside at all weddings held in the church. Of course, in special circumstances, the services of another pastor may be used by arrangement with Resurrection Church’s pastor. The pastor will want to discuss with the couple the nature of marriage and the form of service to be used. It is the couple’s responsibility to arrange with the pastor for the pre-marriage sessions. No marriage can be solemnized without these sessions. Once pastoral approval is given and the wedding date is confirmed on the church calendar, you will be referred to our Wedding Director. You should contact her as soon as possible as she will answer any questions you may have regarding the church. The Wedding Director will be at the rehearsal and will be at the church at least an hour and one-half before the service. Her services are deemed essential, because of her knowledge of this church and its customs, her familiarity with the staff and in order to assure that your wedding is both dignified and proceeds as smoothly as possible. For the same reasons, outside wedding consultants are not permitted. Since the Order for Marriage is a service of worship, all music used with the ceremony should be fitting for worship. It should reflect high standards of quality and should emphasize such things as praise of God, God’s steadfast love in Christ as the foundation for marriage, and the asking of God’s presence and blessing. Our Director of Music is highly qualified to recommend suitable music and should be contacted to set up an appointment at least two months before the wedding. 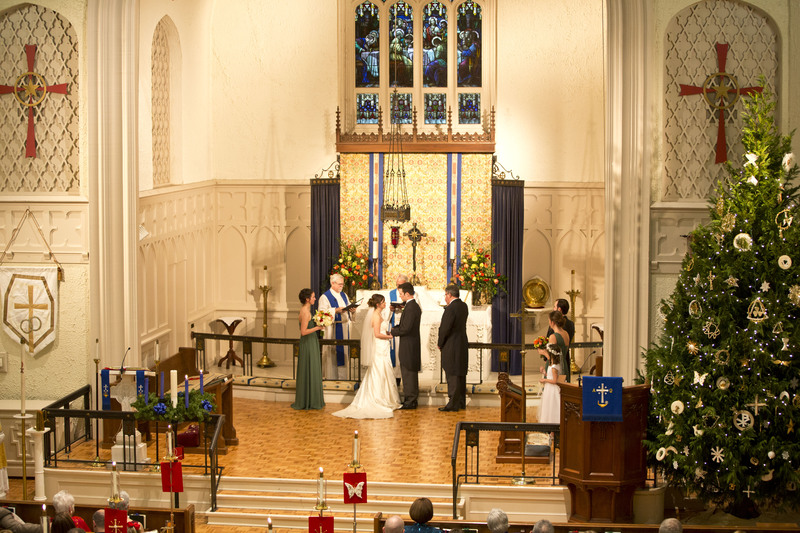 It is the policy of this church that the services of the church organist be used at all weddings in the church. In special circumstances, other organists may be used by arrangement with the Director of Music. The organist’s fees are based upon what is required—amount of pre-service music, etc. Such fees are set in consultation between the organist and the couple. Preparation of wedding bulletins is available in our church office. If you wish to have the wedding bulletin prepared in the church office, all information must be turned in at least three weeks before the date of the wedding. Sample bulletins are available so that you may choose the style you desire. There will be a nominal fee to cover paper and supplies. Our sanctuary has been furnished as a place of dignity and beauty, and it is requested that it not be too elaborately decorated. Altar flowers as well as tastefully arranged candelabra and greenery may be used. Resurrection Church has aisle candelabra available and they may be used by prior arrangement with our maintenance personnel. CHASE CANDLES MUST BE USED in all candelabra with the exception of the aisle candelabra which have oil candles and the unity candelabra which MUST have plastic on the floor under it. All potted plants and palms to be used should be padded and placed on plastic so they will not damage floors. Nothing may be attached (nailed, stapled, glued, or taped) anywhere inside the church buildings. No flowers or greenery may be used on the pulpit, lectern, or baptismal font. No furniture or fixture may be moved or removed from the building. All equipment, candelabra, greenery, flowers, etc. used for the wedding must be removed immediately after the wedding so the church may be cleaned. The altar flowers may be left for the Sunday service if prior arrangements have been made with the church office. Please note that the bride and her florist will be held responsible for any damage caused by the decorations, photography equipment, etc. 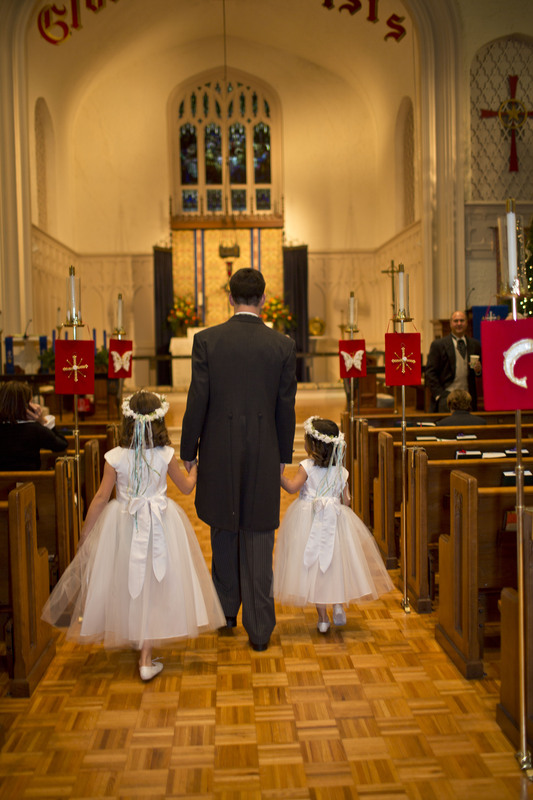 We emphasize again that a wedding is a worship service. The use of flash photography during the ceremony is not allowed. Available light pictures from the narthex and from the balcony are permitted. Video taping may be done during the actual wedding service only from the balcony and with no auxiliary lighting (floods). The bride and groom are asked to inform their guests to respect these regulations. All photographs taken before the wedding should be completed 45 minutes before the service begins. All photographs taken after the ceremony should be completed in 30 minutes. If the reception is held at the church, Reiser Hall should be reserved for that purpose. The church has adequate tables, chairs, etc. However, the couple will need to make arrangements for the preparation and serving of food. If the church’s tablecloths are used, the couple is responsible for the cost of laundering them, and the kitchen must be left completely clean after the reception. It is important that all members of the wedding party arrive promptly for the rehearsal. This is a most important preparation for the wedding ceremony and lasts approximately one hour. The rehearsal will not begin until all members of the wedding party are present. A delay in starting will delay the balance of your evening. The consumption of alcoholic beverages is strictly prohibited on the church grounds and in the buildings. It is strongly suggested that alcoholic beverages not be consumed at home or in other places prior to the rehearsal or wedding. Smoking is prohibited in any of the church buildings. (If Reiser Hall is used for the reception, there will be an additional charge.) Contact Annette Shells at 803-430-3656 to make arrangements for maintenance. All fees are to be paid prior to the wedding rehearsal.